The years leading up to the five hundredth anniversary in 2010 of the death of Giorgione, saw the publication of six major Giorgione catalogs. This truly remarkable publishing phenomenon marked an increasing interest in Venice and the Venetian Renaissance, an interest that seemed to revolve around the mystery surrounding Giorgione and his work. At a conference held in Washington in 2006 to mark an exhibition devoted to the Venetian renaissance, one scholar remarked that the conference was all about Giorgione. Below find brief reviews of the six catalogs, all of them beautifully illustrated. The images below are from the covers of the respective catalogs. In addition to a brief outline of their contents, I have tried to point out their divergent views on the Tempest and on the David Teniers' copy of a "lost" Giorgione, usually called the Discovery of Paris. The learning and exhaustive research of the various authors has been of great value to me, but I do admit that none of them has been able to see the Tempest as The Rest on the Flight into Egypt. Moreover, when they discuss the Discovery of Paris, that only exists in a copy by David Teniers, they invariably follow Marcantonio Michiel's mistaken identification of the painting. 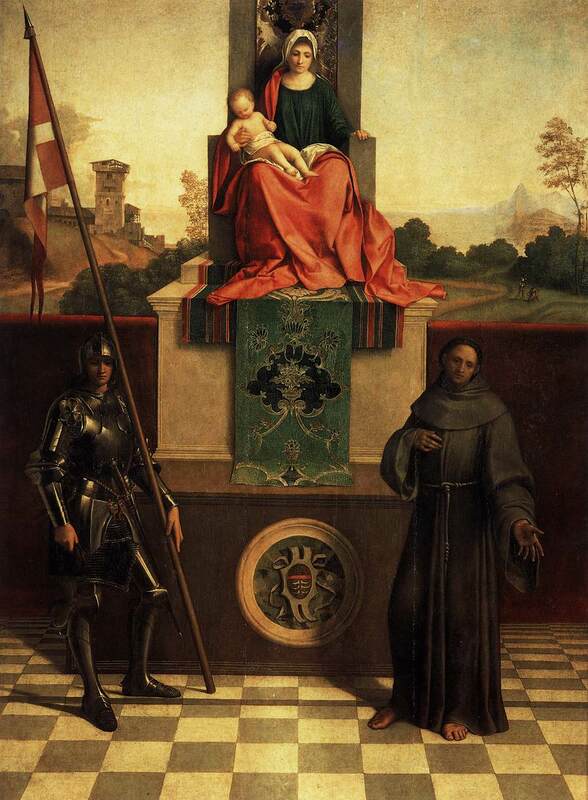 They all attach importance to this lost work but none can see it as Giorgione's version of the medieval legend concerning the encounter of the Holy Family with robbers on the Flight into Egypt. For the interpretation of both paintings see my website, MyGiorgione. Anderson, Jaynie: Giorgione, the Painter of Poetic Brevity, Paris, 1997. Jaynie Anderson’s study is a solo work of almost 400 pages. Seven essays by the author take up the first three quarters of the book. 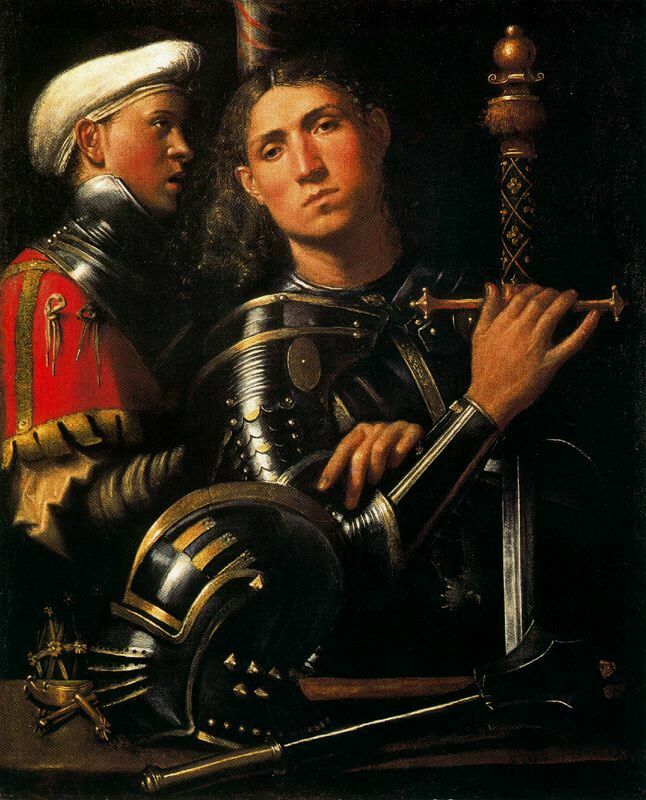 Anderson studies Giorgione’s “poetic style;” his biographers and connoisseurs; the results of scientific analysis of his paintings; his patrons; his imagery of women; his critical fortunes; and his work on the Fondaco dei Tedeschi. This comprehensive catalog is broken up into accepted works; controversial attributions; copies after Giorgione; and rejected attributions. All are discussed in varying degrees. A very valuable feature of Anderson’s catalog is the collection of documents relating to Giorgione in the original Italian at the back of the book. This catalog appeared two years after Jaynie Anderson’s but it obviously represented a lifetime of work on the part of the two Italian authors. 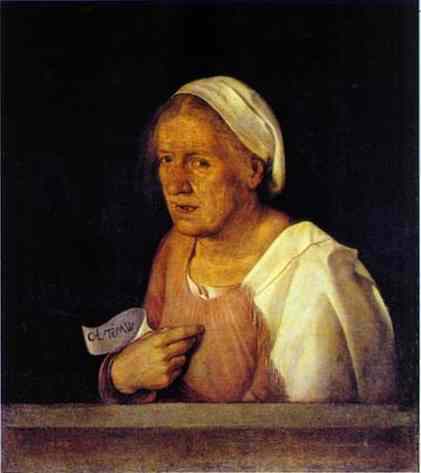 A little less than half the catalog is an essay on “The Life and Work of Giorgione,” by Terisio Pignatti. 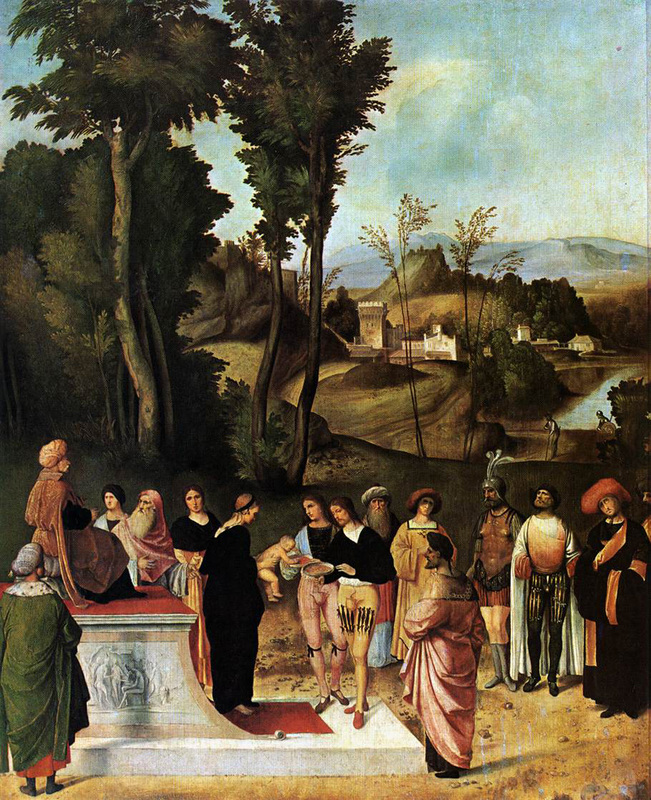 The author discusses the life and background of Giorgione and then devotes about 40 pages to a discussion of the attributed works. In the second half of the book Filippo Pedrocco provides an invaluable summary of the attribution, provenance, and interpretive history of each work. Especially valuable is the attempt to date the various works from early, through middle, to late career. Although Pedrocco lists most of the different interpretations of the Tempest, Pignatti concludes that there is an “undoubted presence of an underlying theme” but that the painting still “remains difficult to interpret.” Like Anderson the authors do not contest Michiel’s identification of the Teniers copy of the Discovery of Paris. Ferino-Pagden, Sylvia, and Nepi-Scire, Giovanna, exh. Cat. : Giorgione, Myth and Enigma, Vienna, 2004. If I could only have one catalog in my library, my choice would be Giorgione, Myth and Enigma, the exhibition catalog for the groundbreaking 2004 Giorgione exhibition jointly sponsored by the Accademia in Venice and the Kunsthistorisches Museum in Vienna. Both institutions contributed their Giorgione works to the exhibition, and for the first time the Tempest traveled outside of Italy for the Vienna show. The catalog featured a number of essays by leading scholars highlighted by a brilliant essay on the Castelfranco altarpiece by Salvatore Settis. There were also four essays offering differing interpretations of the Tempest. The 25 catalog entries were written by a group of world-class scholars including Giovanna Nepi-Scire and Sylvia Ferino-Pagden, the respective curators from the two Museums sponsoring the exhibition. In her essay on the Tempest, Nepi-Scire declined to take sides in the interpretation controversy. This catalog is especially noteworthy for the appendix that includes three essays on the extensive scientific studies conducted in preparation for the exhibition. Brown, David Alan, and Ferino-Pagden, Sylvia: Bellini, Giorgione, Titian, and the Renaissance of Venetian Painting, Washington, 2006. 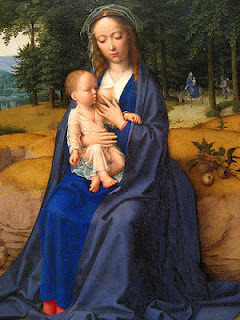 Two years after the 2004 Giorgione exhibition an equally ambitious venture was jointly launched by the Kunsthistorisches Museum in Vienna, and the National Gallery in Washington. The resulting catalog reflected the attempt of the exhibition to cover the broad range of the Venetian Renaissance. 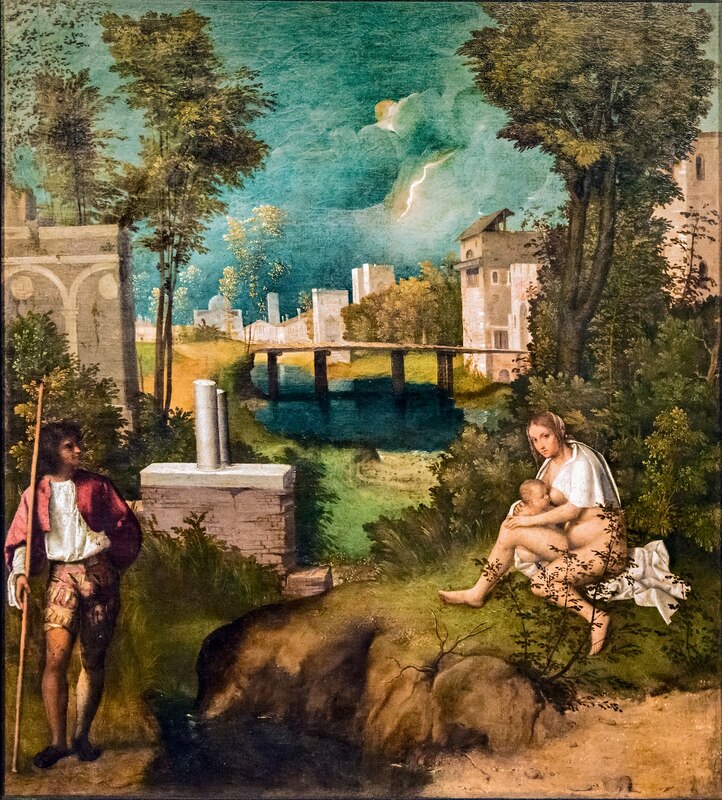 The catalog featured works of Giorgione along with those of Giovanni Bellini, Titian, and lesser known artists like Paris Bordone and Lorenzo Lotto. In the catalog these works were arranged according to themes just as in the actual exhibition. Of all the catalogs this one is the broadest in scope but since the Tempest was not included in the exhibition, there is no separate catalog item on Giorgione’s most famous painting, or a discussion the Teniers' painting. Wolfgang Eller’s Giorgione, Catalogue Raisonne, was not associated with any exhibition. Subtitled, “Mystery Unveiled,” this solo effort obviously represented a lifetime of work on the part of this scholar. Twelve introductory essays take up a little less than a quarter of this 200 page volume, but they are packed with information and learning. Especially valuable is his essay, “The Most Significant Stylistic and Painterly Criteria for an Attribution to Giorgione.” No one looks at a painting or describes it more closely than Eller. It appears to me that his strong point is attribution and he makes some radical departures from the usual. 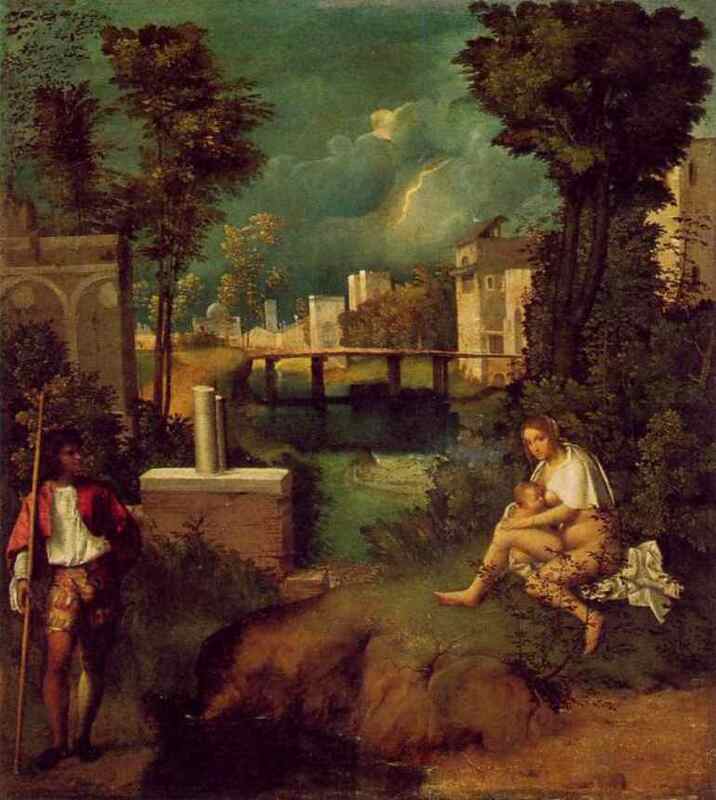 He gives the Pastoral Concert to Giorgione, and also believes that he participated in Titian’s, Noli Me Tangere. If Eller is strong on attribution and painterly criteria, I believe that his interpretations are often overly complicated. His interpretation of the Tempest is so involved that it is difficult to follow. 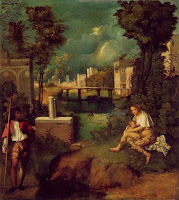 He accepts with some puzzlement the identification of the Teniers copy of the lost Giorgione as the Discovery of Paris. 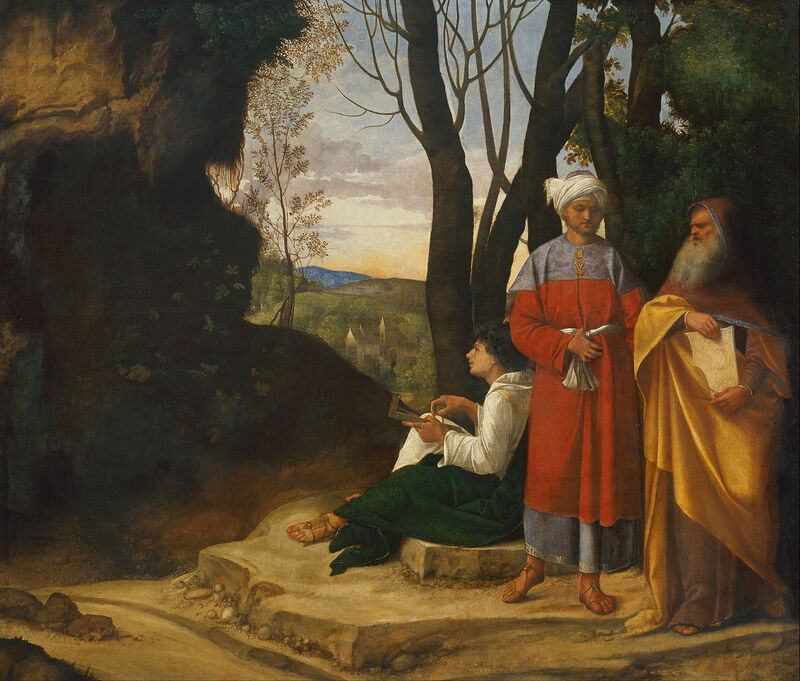 Finally, his catalog is extremely valuable since, like Anderson, he provides a discussion of every painting that was ever associated with Giorgione—even the false attributions. This feature alone makes this relatively inexpensive, and easily usable catalog a must for any student. Enrico Maria dal Pozzolo: Giorgione, Milan, 2009. 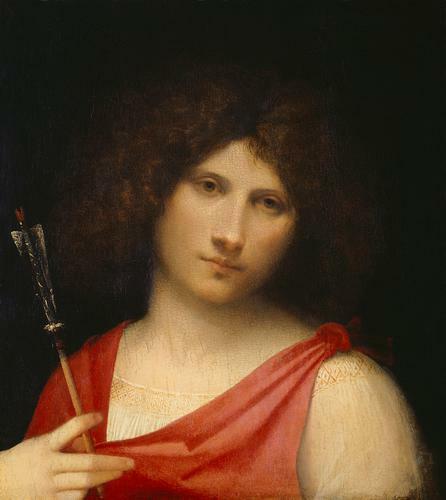 Enrico Maria dal Pozzolo’s book is not so much a catalog as a study of Giorgione and his world. Its monumental size and heft is due primarily to copious and beautifully rendered illustrations, as well as to the extraordinary scholarship of the author. 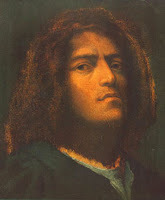 In the first chapter dal Pozzolo reviews what little biographical information we have of Giorgione. Chapter two provides the Venetian and humanist background. 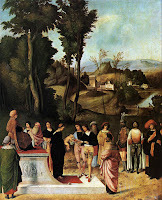 The bulk of the book is in Chapter three, an extensive tour of all the known works of Giorgione. Speaking of Michiel, dal Pozzolo accepts his description of The Discovery of Paris, and attaches more importance to that lost painting than any of the other catalogs. He argues that along with a lost Aeneas and Anchises, it represents the beginning and end of a Trojan cycle. I disagree with many of dal Pozzolo's interpretations but do agree with his learned final assessment of Giorgione.